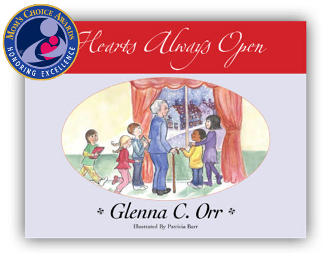 Mom's Choice Awards 2011 Silver Award Recipient: Hearts Always Open is a realistic fiction picture book that tells the story of a very special elderly resident that lives in a community retirement center and the children who have come to visit with her, on a cold and snowy December afternoon. The open-hearted friendship that is shared between dear Mrs. Tully and the children allows for a lifetime of memories to come to life. Hearts Always Open is a book for all ages to read, and a book that speaks to the understanding and compassion that can present itself while bringing the young and the not-so-young together.